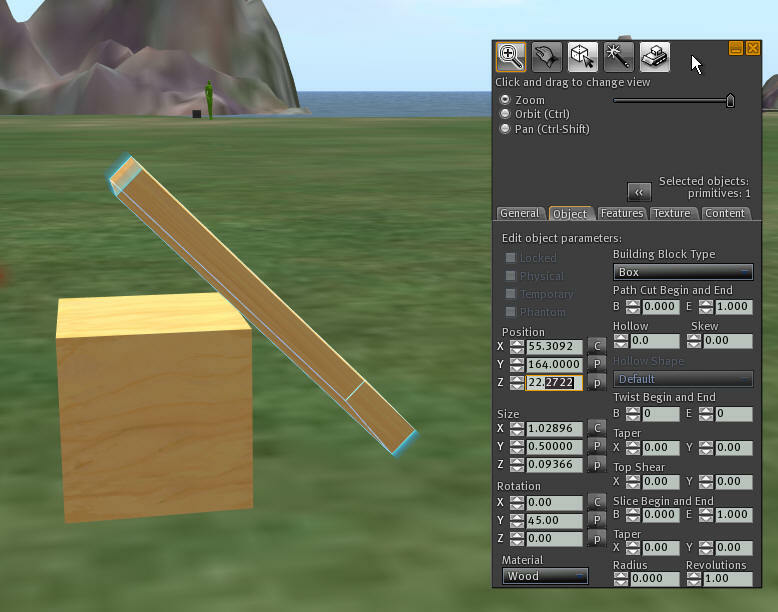 This prim animator is is one of the most useful scripts in Second Life. It is compatible with Archipelis Designer, sculpts, mesges, and prims. Setup is very simple. 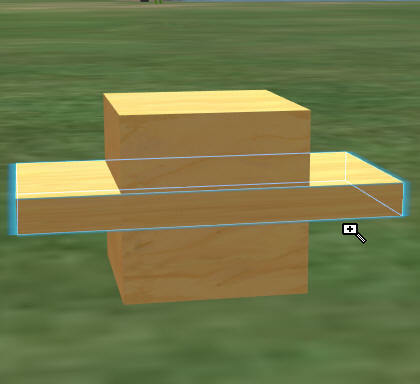 Just drop the scripts into the object, click the object, and give your animation a name. Move all the prims around, and click Record. When done, click the Animation Name, and watch it play back every move! This script uses a new and very fast command called 'llSetPrimitiveParamsFast'. This means that dozens of prims can move almost instantly. You can easily make almost anything move with no scripting knowledge needed. Limits: It cannot move/animate avatars that are sitting on a linked prim. 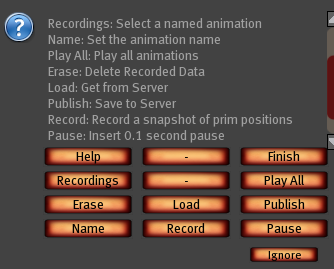 Unlike other $$ prim puppeteers and animators, there is no need to rename any prims, no need to rez and re-rez, and no limits on memory storage or number of animations or prims. It's also expandable and can take commands from other scripts. And best of all, it is open source! 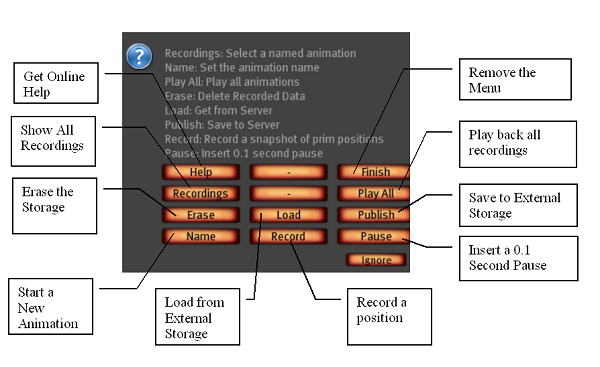 Storage: The system automatically saves your animations to one or more storage scripts so you will not run out of memory. If you reset your script, it will lose the contents, but you can click a Save to Server button and save your data in secure, safe online database. Easy to control: I am including example Sensor, Rez, and Wandering Pet scripts to make it easy to add animation triggers. Custom name your animations to run different animation sets independently of each-other in the same object. Finish - locks the Menu out so you cannot animate by accident. Record - Saves the current position of any prims that have moved. The first step is to name your animation. You can store as many animations as you want in the menu. Click 'Name' on the Menu. A menu will prompt you for the name of this animation step. (Some viewers will prompt you to enter the name on a channel) The number changes each time so it will not interfere with other people who may be editing while using the same script. In this example, it suggests channel /656. Type in a name on the channel it indicates, such as '/656 Test1'. This would be for an animation named 'Test1'. The slash and number tells Second Life this is a private conversation with the prim. Click the name that you called your animation, and watch it play back the movements. You can click PUBLISH to store the coordinates on an online database. If you reset reset the script, you can recover the data by clicking LOAD. It will reload all the coordinates and be ready to go again. The first script is a simple touch and playback script. When touched, it plays back animations named 'stand' and 'sit' in order, then the next time it is clicked, it plays 'sit'. This next script is a sensor script. If an avatar gets within 5 meters distance, it plays back animation 'sit'. When all avatars have left, it plays a 'stand' animation. 'right' should put the right legs forward, as when walking, and 'left' should do the opposite. 'sit should be the animal sitting down, or begging. 'stand' should be the position the animal is in when walking, with legs in a standing position. 'wag' is the tail wagging back and forth. float STRENGTH = 4.0;  // how hard to turn, bigger = ?